Writing good page titles is an essential skill for anyone doing SEO. Why? 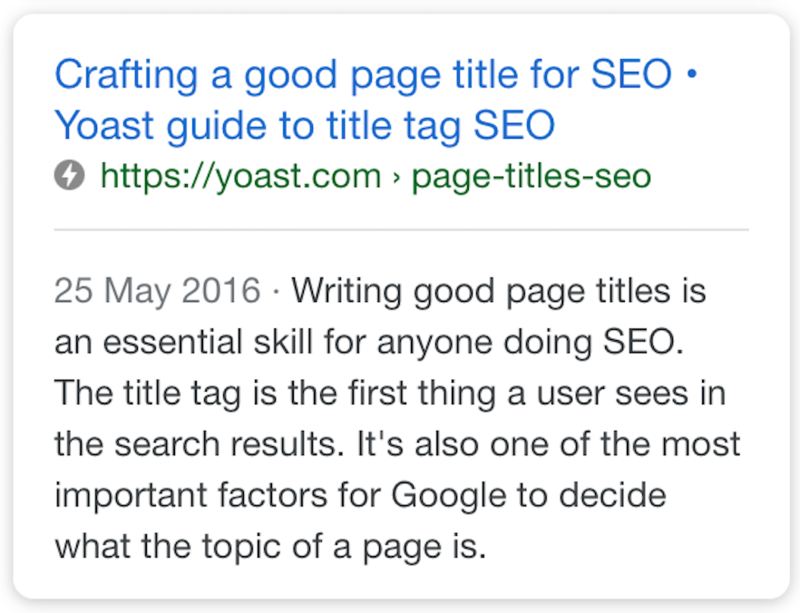 Because the title tag is the first thing a user sees in search results, but it’s also one of the most important factors that Google uses to determine the topic of a page. This makes titles essential to SEO and this article covers both why you need great page titles and how to create them. Conclusion: Page titles - craft them well! In tabbed browsers, this title is usually shown in the page tab, as shown in the image below. Don’t confuse it with the main heading of the page, which the user sees on the page itself. However, the main heading is important too, and if you want to dive deeper into that, we have an entire article about headings and SEO. These two goals are not mutually exclusive, but they do sometimes have competing interests. If you’re ranking well but nobody is clicking on your result, that ranking isn’t doing you much good. Be warned that if you’re ranking but never getting clicks your rankings might deteriorate over time. Google uses the CTR (click-through rate) to help it decide how relevant you are for a specific keyword. If your CTR is lower than what Google expects you would get at a certain position, your rankings will drop. The opposite is also true, so a title lower down that gets people to click will also help you rank better. If you’ve chosen a good focus keyword for your post, make sure you include that focus keyword in your page title. As I said earlier, the page title is one of Google’s most important ways to figure out your page’s topic, so not having the focus keyword in the title severely damages your chance of ranking. People scan search results, so it’s important that the title immediately catches their eye. This means that having the focus keyword at the beginning of your page title will help encourage clicks as Google will highlight it when people search for it. Sometimes, when you’re optimizing for a high-competition keyword, everyone will have the keyword at the beginning of the page title. In that case, putting one or two words in front of your focus keyword, thereby slightly “indenting” your result and making it stand out from the others, can be a good idea. The optimal length for a title is determined by how much of it Google will show in their search results. How the results look may also vary, depending on the device you’re using. You can check how your SEO title will look in the search results in the snippet preview in Yoast SEO. The tool uses the mobile version as a default, but you can also switch to view it in the desktop version. So how many characters from your title will Google display? That depends. Rather than using a character count, Google has a fixed width in which it can show the title. This means it will show many more i’s than w’s, so a lot depends on your choice of words. Our snippet preview takes this into account and shows your title as it will appear in Google searches. If your title is too long (or too short) the green line underneath it will turn red, so watch out for that. As the optimal title length for SEO varies per type of result, we would suggest getting your most important keyword in the first half of the title. For quite a while it was a fashion amongst some SEOs to leave the site name out of the page title. The idea was that the “density” of the title mattered and the site name wouldn’t help with that. Don’t do this. Your page title needs to have your brand in it, preferably in a recognizable way. If people search for a topic and see your brand several times, even if they don’t click on it first time, they might click when they see you again in their next page of results. If you don’t include your site name in your title tag, you’ll also run the risk of Google automatically changing the title for you. As explained in our article on why isn’t Google showing my page title, Google thinks it needs to be there too. If you want to read more about branding, be sure to read this post by Marieke: 5 tips on branding. As you can see this doesn’t necessarily improve the rankings of this page at all. From a keyword perspective, the title isn’t much better, but it is more enticing and it did lead to much more clicks, which, of course, was the desired result. For social media, you often don’t need to include the brand name in the title. This is especially true for Facebook and Twitter if you include some form of branding in your post image. 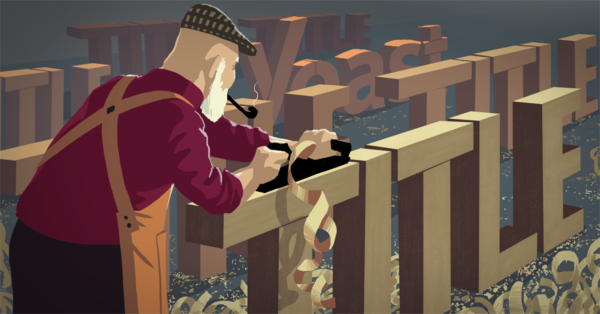 Our social previews in Yoast SEO Premium can help you with that. 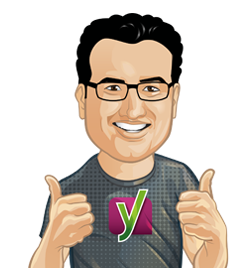 If you’re using Yoast SEO, you can have a separate title for Facebook, Twitter and Google. 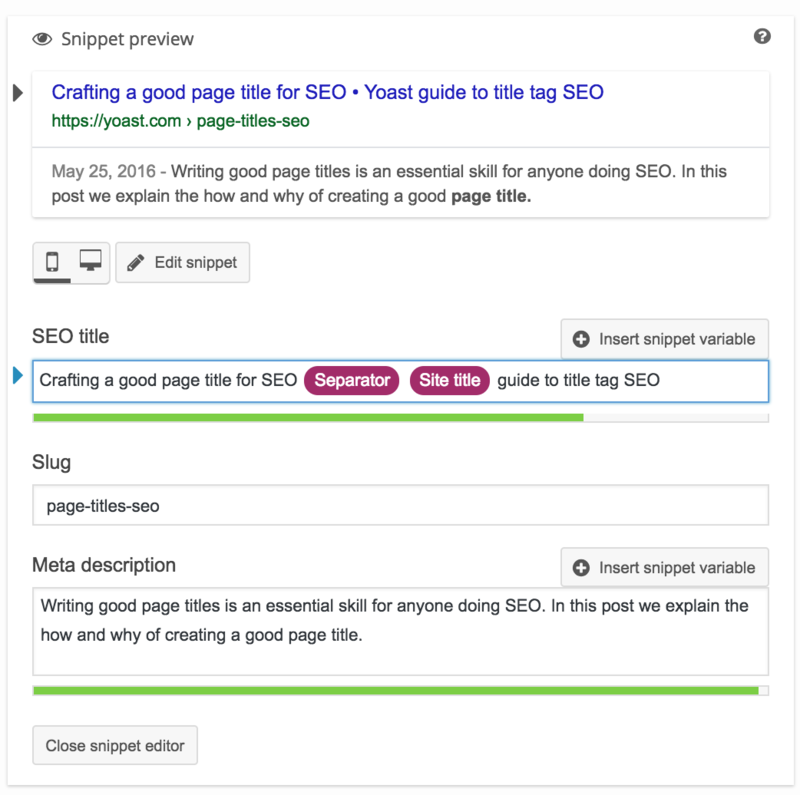 Just enter the Google title in the Yoast SEO snippet editor. The Facebook and Twitter title can be entered on the social tab in their respective fields. If you don’t enter a specific Twitter title, Twitter will use the Facebook title instead. Conclusion: Page titles – craft them well! In conclusion, the main point of this article is to encourage you to invest a little more time in writing good page titles. It really is worth it. Going back and optimizing some of your page titles after publication also might also be worthwhile. This is especially true if you’re already ranking well, but aren’t getting very many clicks. Moreover, meta title could be different from the article title in the blog. They have different purposes. Not only they improve your ctr but they also can help you boost your search engine traffic (if optimized well with the proper keywords). I also highly recommend you to give a try to headline generator tools like Portent. It’s much easier to write effective headlines once you know what your target audience are craving for. Read copyblogger posts on writing great headlines and you will be able to easily create tons of compelling titles. Hello, I’m from China, I understand that you are doing on the site SEO optimization, promotion, I have a website: http://www.fashion-gv.com, need your help, I hope we can cooperate success and look forward to your reply! Thank you for your indept article. 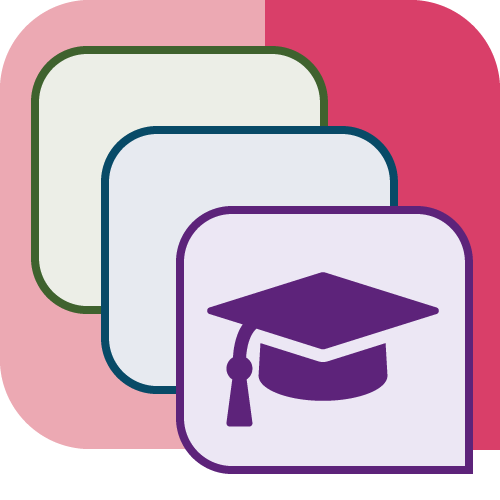 Can I just change my category/article title with the Yoast plugin? I am worried that these links go in a 404 response.